Britt from Bee LittleQueen Blog! The sunshine award is for: “Bloggers who positively and creatively inspire others in the blogosphere”. I'm super excited to get this award. I really try to be positive and encouraging on my blog, so getting this award was really encouraging. Select 10 of your favorite bloggers, link their blogs to your post and let them know they’ve been awarded the Sunshine Award! Favorite color? - Pink...coral to be specific! Favorite animal? - I'm not really an animal person...but I do like dogs okay and I want to own chickens someday. Favorite drink? - Hmmm...diet pepsi, coke zero, and carmel macchiatos. Good book or good movie? - Oh wow...book. =) Though I do love a good movie as well. My passion: - Jesus...and then teaching and writing. I love to writing...anything and everything. And I love to teach writing. But mostly, I just love to teach! Often I can teach things that I can't do myself...don't ask me how. Teaching gives me energy. I LOVE, LOVE, LOVE it! Favorite day? - Days that I can hang out and with my friends and family with quality talking time and deep conversations. Of coarse the day would probably start with sleeping in, a run, and a coffee date with my hubby at Starbucks. Favorite flower? Wow! My answer on this is the same as Britt's answer...Sunflowers! How awesome is that? They are so pretty! I like gerber daisies and babies breath are beautiful too. However, I also agree with Britt that basically any wild flowers are AWESOME! Nominations: This is the fun part for me! 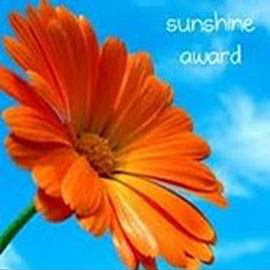 A big thank you to Britt from Bee LittleQueen for awarding me this cool award...the Sunshine Award!